Search Engine Optimization [SEO] is a technique to increase the amount of visitors to a website through higher rank in search engine results. Google, Bing, Yahoo, etc are the examples of search engines. 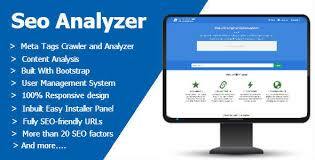 SEO Analysis services everything you need to know so you can easily optimize your site. And increase your visitor traffic from the search engines. Our company work to get higher search results for your website. It is sure that the SEO Analysis is an important aspect to make your website rank higher in the search engine. So we are there to provide you the best SEO Analysis Services For your website. Seozooms is one among the best companies which give the most affordable SEO services Cochin. On page Optimization is the process of websites optimization that includes adding keywords to your web page and linking your web pages together with keyword optimized links. SEO is the term used to describe a set of process that aim in optimizing a website for search engines. SEO is important not only for getting high quality visitors but it is also a way to increase the credibility of a website and expand brand awareness. We do when we start working with client on a search engine optimization project is perform a head to site analysis. All Websites are different. For making SEO plans, Analysis is important. To winning the competition or improving your search result, There is no magical way. But the most important aspect is Analysis. If you want to get visitors to your site from search engines, you have to analyze your site first.